What Do I Wear When I Work Out? Here are some tips about what to wear when working out. Pants, shorts, t-shirts, tank tops - wear what you are comfortable in. Try on your work out clothes before exercising. Make sure your clothing does not slide down, ride up or show anything you may not want to show. Different workout clothes suit different activities and weather. If it is cool out, dress in layers so that you can take a layer off if you get hot as your body warms up from exercise. If it is warm, dress in light, breathable fabrics in light colors. If you are going on a run or a walk, shorts or pants and a t-shirt or tank top would be fine. If you are doing yoga or Pilates, fitted clothing would be better in order for you to move freely. Proper shoes are important for physical activities. Invest in quality shoes that suit your activity of choice. 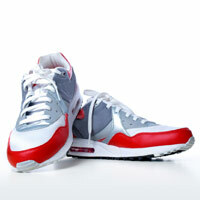 For weight training or low-activity sports wear running or walking shoes. For running, get proper running shoes so your feet will be supported. For specific sports like football, soccer, etc., get the sport-specific shoes. Wear helmets or other protective gear that are used for many activities such as biking, rollerblading, and skiing. There is no right or wrong dress when it comes to what to wear when exercising. Just wear what makes you feel most comfortable and remember to stay safe.